Gold Wave Editor can record any sound passing through any line of your sound card. For example, you can record sound being played back by an external program, sound from a microphone, an external LP, cassette, CD/DVD player, AM/FM/Satellite radio, etc. A built-in sound editor allows you to cut, trim, and merge your recordings. 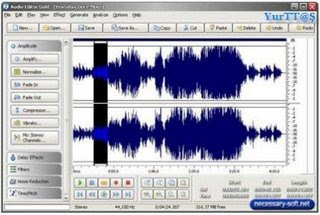 Editing can be performed using a visual representation of the sound and using clipboard operations. Supports all major audio formats. You can also use the build-in CD ripper to copy all or some of your music tracks from your personal CD collection.